Bill Seward has been holding a summer cut-throat tournament so popular it has grown to nearly 100 players. So what did he and his wife Tracy decide to do? Hold a fall tournament, of course! The 2009 Seward Family “Fall Classic” Croquet Tournament was held on Saturday October 10th at Discovery Park in Sacramento, under clear blue skies and 80 degree California weather. With over 70 players, this event promises to rival its summer counterpart. One of many ingenious features of this event is that the Sewards charge no fee. Players are simply invited to play. Those that have a great time, in turn, invite their close family or friends to play the following year. And so on. Players who don’t share the same level of ethics and fun are simply not invited to return, thus eliminating poor sportsmanship. The result is an event that seems like a “family reunion”. The Sewards also do a fantastic barbeque, with others encouraged to bring various courses pot-luck style. There’s enough food to feed a small army. To accommodate the multitude of players, the Sewards put out eight courts, each measuring 60 by 30 feet. Each court was named after a famous golf course, so players could easily find their court on a large map of the park. Another nice touch was that every corner of every court was adorned with an American flag. Six players were assigned to play on each court. Every game had an on-court referee to decide disputes among traditional foes and to help new players with the rules. Players randomly plucked balls out of a bucket to determine the order of play. The games had no time limits, and ended after the first three players pegged out, with three points for first place, two for second, and one for third. Most games only took 30 to 40 minutes to complete; a few took almost two hours. 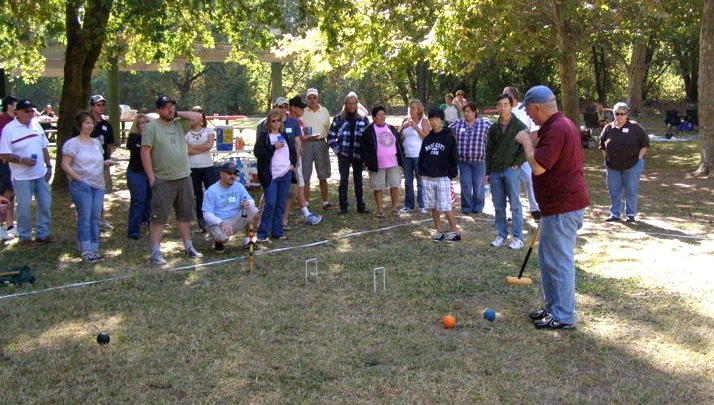 To win the event required going through a three-stage croquet gauntlet. First, everyone played two qualifying games. Next, the top 18 point-scorers progressed to the three semi-final matches, 6 in each match. The first two players to peg out in each semi-final match moved on to the 6-player final. The quality and intensity of play increased at each stage. For the final, spectators ringed the court with their lawn chairs and cheered lustily for their favorites. Another ingenious feature of the Seward events is that past champions are awarded burgundy shirts, so that tournament favorites were easily spotted in the crowded field. One of the finalists, Les Robinson, donned a burgundy shirt due to his past exploits. Bill Seward served as the master of ceremonies and referee, using a microphone to provide commentary as the final unfolded. The raucous crowd enjoyed every moment of it. The six finalists had varying levels of Seward tournament experience. Les Robinson was a prior winner. Abdul Elahi and Ron Mock were no strangers to the final game either, although neither had won before. Mitch Meredith, Donna Bahneman and Eric Sawyer were all new to the finals. In fact, it was Eric’s first Seward tournament, Mitch’s second, and Donna’s ninth. The final match was a see-saw battle. Les and Ron each made early runs and got out in front. Eric made a big run on his second turn, but made a huge tactical mistake by trying to rush balls in position for a three-ball break only to go out of bounds and out of position to make the sixth wicket. That allowed Mitch, Donna, and Abdul to each make their own runs and get into the game. As twilight cast its curtain, Les made one final run to peg out first and win his second Fall title in the past three years. Abdul made a final run to peg out second. Ron was awarded third place based on the number of wickets he scored when the final match was called due to darkness. Mitch, Donna and Eric took fourth, fifth and sixth, respectively. The three top finishers were placed on a podium, given their trophies, serenaded with the National Anthem, and then doused with champagne. A great way to finish. In sum, this event featured camaraderie, good food, and great competition, all in a patriotic environment. 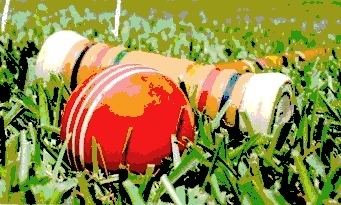 What else could a croquet player possibly want? How about an invitation to the summer tournament!